The Lakeside is a 520 square foot cabin with one Private Queen Bedroom, plus a Loft with two Queen Beds, a Fold Out Twin Bed, Full Kitchen , Full Bath & Flat Screen TV. The front porch is 10’x16’ overlooking scenic Lake Travis. 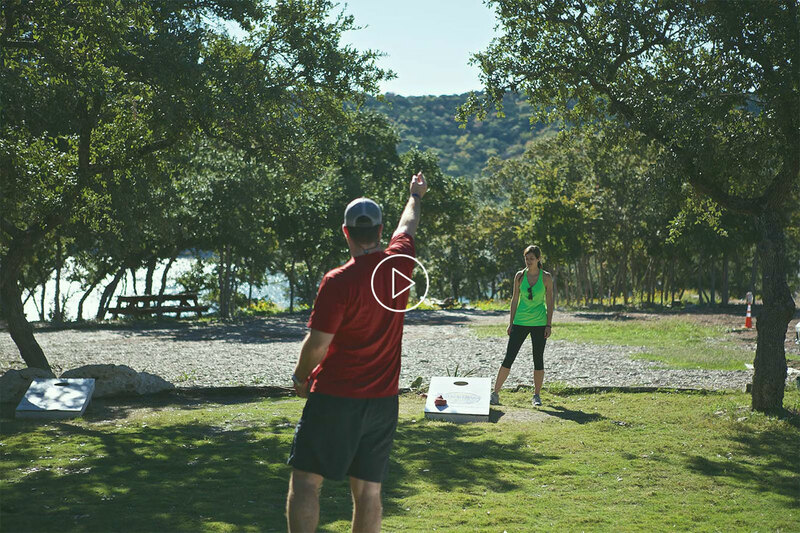 Your stay includes access to our Private Beach, Grill and Picnic areas on beautiful Lake Travis. In addition, each guest is entitled to a 10% discount for the Thrills and Chills of Lake Travis Zipline Adventures exciting Zipline Tour. Guest: These prices are for 6 guests per cabin. A $39.00 fee per person per night will be added for each person above 6 people up to a maximum of 8. $45 Cleaning fee per cabin. "BEAUTIFUL PLACE AND PEACEFUL VIEWS"
"Came for a 3 day girls trip. Stayed in the cabin on the property.I absolutely loved the cabin. Full size fridge, stove, microwave. Fully furnished with everything you need. 6 adult ladies shared one bathroom and we never had a problem. Beautiful and peaceful views. The zip line was amazing. Our guides Nolan and lizzy we great .Made us feels very comfortable. We had a great time . Everyone that we talked to that worked on property was very helpful . I definitely recommend this place. Family vacation or getaway trip." MAKE A RESERVATION, CALL US NOW! We at Lake Travis Zipline Adventures look forward to showing you the “Adventure of a Lifetime”. The Lakeside is a non smoking cabin with no pets allowed. Check in is a 3:00 pm and check out is at 11:00 am.